Tour Cost: $1,895 per person. Group discount of 5% for groups of 4 or more. Bike Rental: $200- Lizard Head Cycling Guides offers brand new 2019 Scott Genius 730 27.5 PLUS full suspension bikes. These are comfortable machines that provide an exceptional level of stability and comfort. If you dig your ride, you can take it home! Click here for more info. Riders can of course use their own bikes. Rental Tent, Ground Pad and Sleeping Bag: $85 Lizard Head Cycling offers late model camping gear rentals. The rental tent is a 3-person Sierra Design tent (sleeps 2 comfortably). The ground pads are 1.5 inches thick and our synthetic sleeping bags are rated for 20 degrees (so you’ll feel warm & comfy in the Utah Wilderness). **Al la Carte tent rental is $55-. Tour Includes: 5 days of guide service, 2-nights of lodging, 2 nights of camping, all meals (two at John’s favorite Hell’s Backbone Grill! ), forest service fees, energy food, liquid refreshments, shuttles and mechanical support. Alcoholic beverages, bike rental and massage are additional. 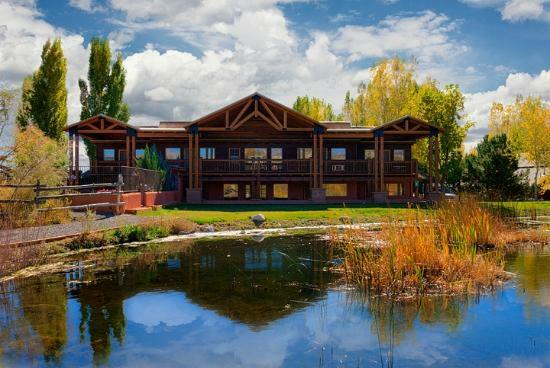 Accommodations: Two nights lodging at the Boulder Mountain Lodge, in Boulder, Utah. Two nights of camping. 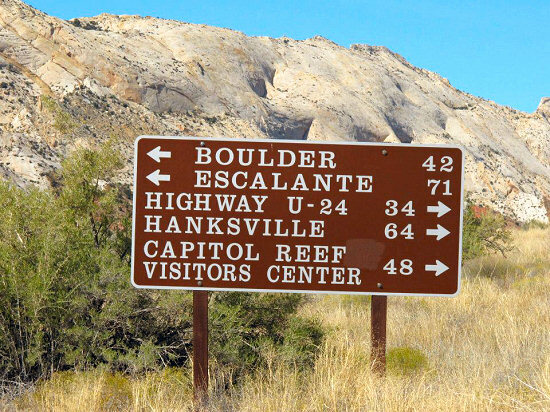 The tour meets at and departs from the Courtyard Grand Junction in the morning where we load bikes and gear into the support vehicle and then embark on scenic drive across the Beehive state. 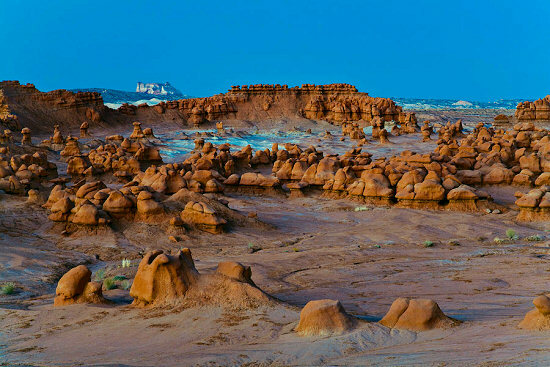 Along the way we make a stop at the other-worldly Goblin Valley State Park just outside Hanksville and then into Capital Reef National Park. 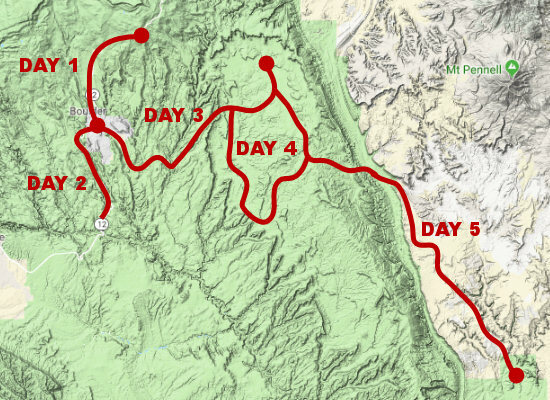 We will shuttle to the top of Boulder Mountain and then get on the bikes to embark on a super-fun 2,800 foot descent along Highway 12 to Boulder, Utah to check into our favorite lodge of all, the Boulder Mountain Lodge. 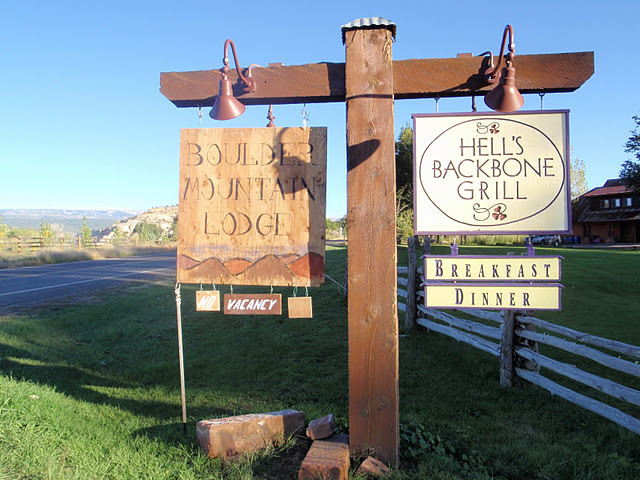 For dinner we’ll unwind and dine at the award-winning Hell’s Backbone Grill where gracious owners and wonderful hosts, Jenn and Blake, treat you to a truly delicious and eclectic offering of fine dining choices. Their restaurant has received numerous praise, including this New York Times Story. 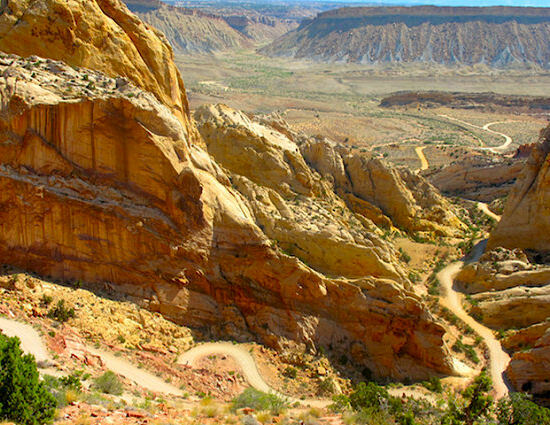 On our first cycling day we ride from Boulder to the Calf Creek Recreation Area along the highly scenic Utah State Highway 12. 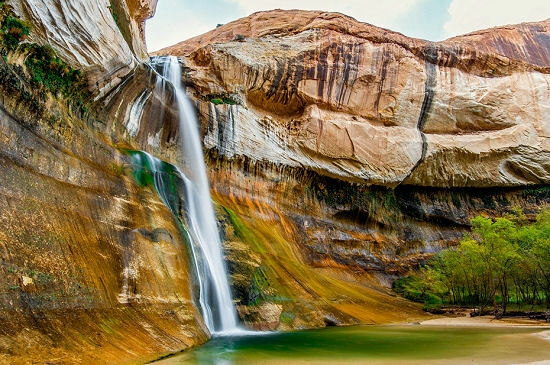 Once at Calf Creek we change into hiking boots and enter this enchanting desert oasis with lush vegetation and beaver ponds soon arriving at the year-round 126-foot cascading waterfall of Lower Calf Creek Falls. 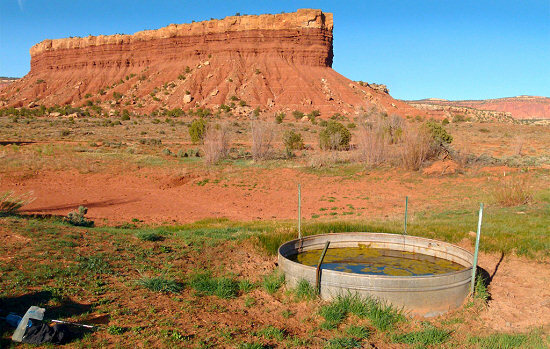 We will spend a few hours searching Indian ruins and petroglyphs, then observe birds, deer and (if we’re lucky) a mountain lion. Enjoy lunch in the shade beneath the waterfall. 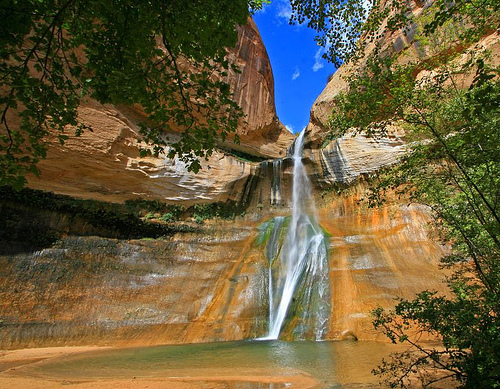 After the 5-mile walking roundtrip to Lower Calf Creek Falls, you can call it a day or challenge yourself with the 12 mile return ride back to Boulder. Upon returning to the resort, take a walk around the adjacent bird sanctuary or enjoy a nap under a large cottonwood tree. We love the Boulder Mountain Lodge! 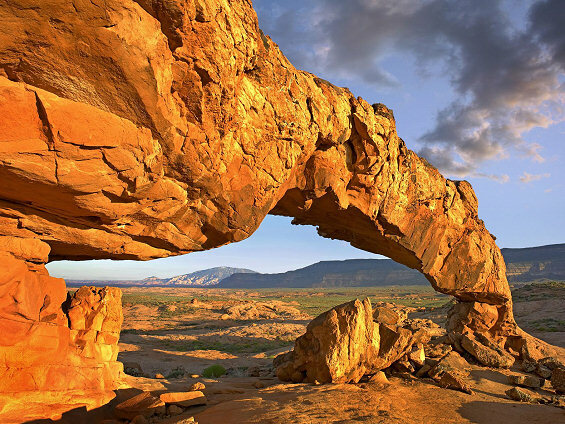 Starting from Boulder Mountain Lodge, we begin riding down along the paved Burr Trail and through the Grand Staircase-Escalante National Monument passing through The Gulch, the Circle Cliffs and Deer Creek Recreation Area. 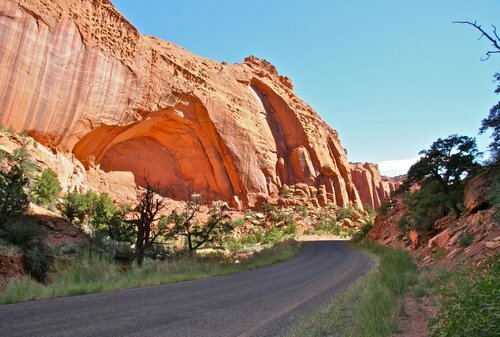 Along the way you will be amazed as you ride past the 400-foot tall Wingate Sandstone walls of Long Canyon to dazzling views across the high desert canyonlands. Turning off the Burr Trail we hit some dual-track making our way to our campsite near the Lampstand Mesa which will be our basecamp for the next two nights. This day is a mix of pavement and dirt. 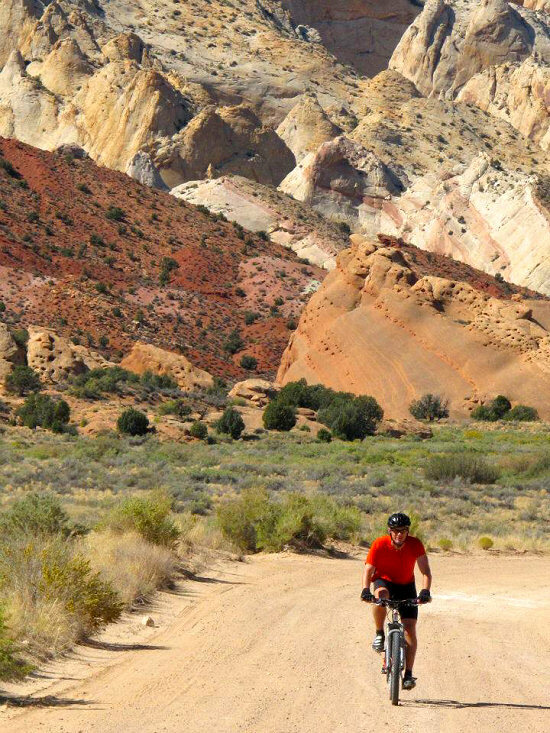 Riding from basecamp, we pedal along the Burr Trail to the start of the Wolverine Loop Road where we find ourselves deep in pinyon and juniper trees and more amazing Wingate Sandstone. This road offers some great downhill sections and moderate climbs rewarded with commanding views of the Henry Mountains. 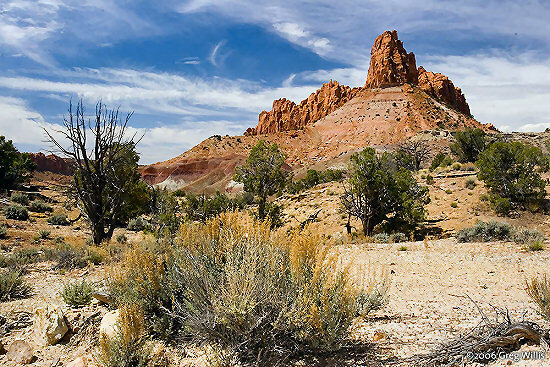 We continue along Wolverine Loop Road through Death Hollow and then to Wolverine Petrified Wood Area for lunch and then a hike. Continuing on our ride we ride through Horse Canyon and Wolverine Canyon eventually making it back to the Burr Trail and then completing the day back to our campsite. 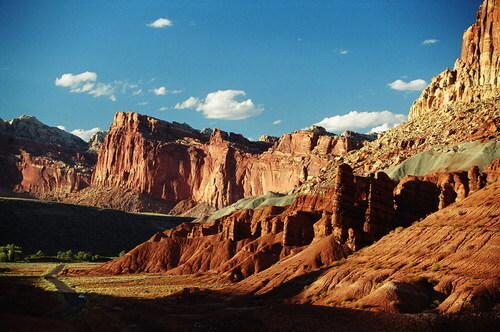 After packing up camp and after a hearty breakfast, we pedal down towards the Waterpocket Fold which is a massive geological land form known as a monocline that spans for over a 100 miles through the semi-arid plateau of central Utah and which defines Capitol Reef National Park. 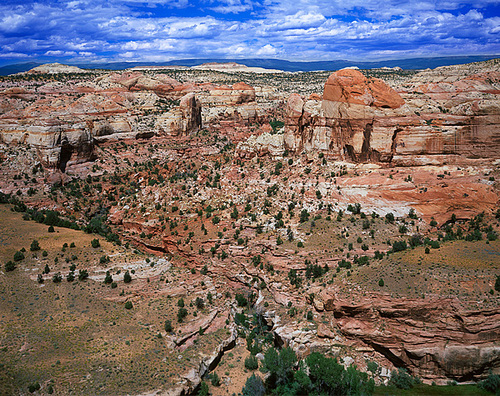 We will stop along the way for a short hike in Upper Muley Twist Canyon to glimpse the dramatic views of the Waterpocket Fold from the Strike Valley Overlook. After the hike we descend down the twisty switchbacks of Burr Canyon. After Burr Canyon we ride along remote desert dual-track of Burr Trail on top of Big Thomson Mesa with the Waterpocket Fold to our right for most of the afternoon eventually making our way into the upper reaches of Glen Canyon National Recreation Area where the riding ends. We load up the support vehicle and then shuttle back to Grand Junction to end our tour. 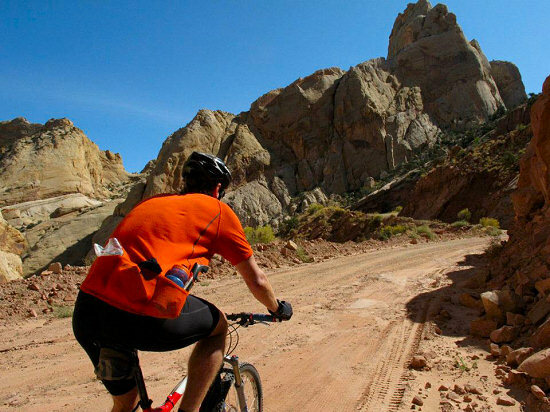 This custom tour is designed for cyclists with various levels of fitness. Each day there are additional mileage options for advanced riders.